MoCCA Arts Festival is this weekend (April 7-8 at Metropolitan West) and I will be trying out something new this year: “PENNY-PER-SECOND” SKETCHES for which customers can commission timed sketches via either (Option A) STOPWATCH Sketching in which payment is based on exactly how long it takes me to complete a given drawing -or- (Option B) COUNTDOWN Sketching to be completed within an agreed-upon maximum time… all at the bargain rate of just one-cent-per-second! To provide a few examples for the math-averse, that works out to just $3.00 for a quick five-minute pencil or brushpen sketch (300 seconds), $6.00 for a ten-minute pencil or inked drawing (600 seconds) or $18.00 for a half-hour piece (possibly inkwash, watercolor, or color marker). Over the past few years of regular Sketch Night (e.g., Drink-n-Draw) life drawing sessions, I’ve gotten a lot of practice at speed sketching 2-minute, 5-minute, and 10-minute poses so – even thought this way works out to less than what I’d normally charge for similar commissions – I’m looking at it as a fun gimmick to challenge myself and, hopefully, get more commissions by turning it into a bit of a spectator event. To that end, I’ve already downloaded a nice game timer app to my iPhone which shows (up/down) running time in a big red digital display down to the tenths-of-seconds and even has optional air-horn buzzer at end of countdown. 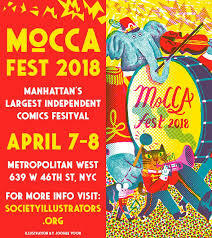 If you’re interested in pre-ordering a timed commission to be picked up at MoCCA Fest, please contact me before midnight Friday to arrange details (e.g., character/theme and timing option). Incentive: since I’ll probably use pre-orders as my morning warmups, you may even wind up being able to choose from multiple iterations of your chosen theme by the time you come to retrieve your piece.